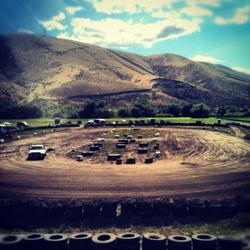 1. the Joel's Tire Motorsports Complex at Fulbright Park in Union Gap, WA. Whiplash Sports had a great time out at the Joel's Tire Motorsports Complex this year and we hope you all did too! We want to take a minute to thank everyone who made this all possible. A huge thank you to all the riders! Whether you came out with E.W.F.T., Quadcross NorthWest, Phat Boyz Racing, or just came out on your own to race and have a good time. We also need to thank everyone who came out and supported their sport, and their riders. Whether spectating, or helping wrench on machines, motorsports needs you. And of course, none of this would be possible without our sponsors! Joel's Tire, Owens Cycle, CMS Construction, Columbia Asphalt, Yakima Valley Sports Commision, HOT 99.7, Jackson's Sports Bar, Action Towing and Storage, TALK 980, Super 8 Motel, VP Racing Fuels, Best Western, Costco Wholesale, KAPP 35, The Tractor 1390 AM, and Sterling Bank. Please make sure you look to these local businesses first when you're shopping around. They support your sport and are helping to keep racing alive and well in this economy. We hope you all have a great winter, and stay tuned! We're working hard to make sure next year is even better! Like us on Facebook for all the latest info, photos, updates and movies!